Looking to continue its historic dominance in the performance CPU market, Intel just pulled the curtain back on its all-new line of X-Series processors, and boy are they something. Boasting as many as 18 cores and 36 compute threads, these are some seriously powerful chips, and you won’t have to wait long to get your hands on them. 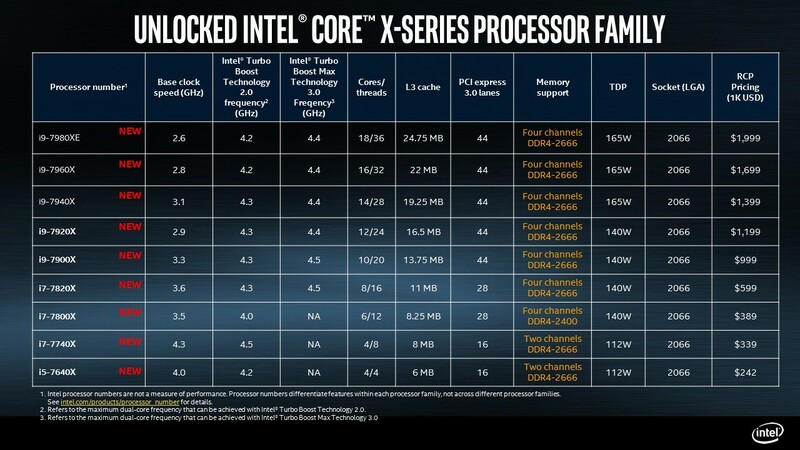 Intel’s X processors have always been the wildest of its many offerings, topping the company’s other unlocked CPUs in terms of sheer power and capability. That trend obviously continues today, with the new socket 2066 chips starting with the i5-7640X and going all the way up to the truly insane i9-7980XE. The core count of the new lineup is extremely varied, with options for 4, 6, 8, 10, 12, 14, 16, or 18 cores, with threads of double those figures. The new X-Series chips will be able to pull their weight when it comes to gaming — especially the four-core, eight-thread i7-7740X — but these CPUs are really being pitched to content creators above all else. Most modern PC games are great at utilizing four CPU cores, with only a select few actually taking advantage of any more than that. However, many rendering applications and 4K video edition software are built to utilize as many cores as possible, and Intel’s marketing for the new hardware clearly targets those developing high-end video content and virtual reality applications. The new chips are expected to be available starting in September, with prices ranging from $242 for the i5 and $339-$599 for the i7s, all the way up to $1,999 for the best-of-the-best i9.